The former head of China Aviation Oil (CAO) has been sentenced to four years and three months in jail for his role in the firm's near-collapse in 2004. Chen Jiulin, who had earlier pleaded guilty to six charges including insider trading, was also fined 350,000 Singapore dollars ($207,300; £124,000). Four directors at the company had already been sentenced by a Singapore court for their part in the scandal. CAO almost collapsed in 2004 after running up losses of $550m. The Singapore-based company, which has a monopoly of China's jet fuel market, did so by wrongly betting against future movements in the price of oil, and then trying to hide the losses from investors. 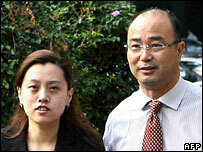 Mr Chen had initially been facing 15 charges, but admitted six as part of a plea bargain. Earlier this month Mr Chen's former colleagues Jia Changbin, Gu Yanfei and Li Yongji were fined a total of 70,000 Singapore dollars after pleading guilty to charges of insider dealing and failing to disclose losses. In February, former chief financial officer Peter Lim pleaded guilty to conspiring to cheat and producing false financial statements. He was jailed for two years and fined 150,000 Singapore dollars. CAO's problems became one of the biggest corporate scandals to rock Singapore since the collapse of Barings Bank in the 1990s. Its losses were discovered in November 2004 when the company forced to seek court protection from creditors. A $130m rescue package involving UK oil giant BP and state-run Singaporean investor Temasek was announced later that year. The deal was finalised earlier in March and the CAO is expected to resume trading on the Singapore stock exchange later this month.